Color your planner! Cityscape designs decorate the pages of this professional weekly/monthly planner for coloring and doodling while making your schedule. Dated planning pages range 12 months from July to June and feature monthly tabs for easy reference, count of days/days remaining and holidays. Two-page-per-week spreads include ruled daily entries for even the weekend days, Monday-through-Sunday scheduling, numbered weeks and moon phases. The two-page-per-month spreads offer unruled daily blocks, Sunday-through-Saturday scheduling, moon phases, ruled notes section and one past and future months reference. Special pages include holiday listing, three-year (past, current, and future) reference calendars, event calendar, contacts and notes pages. It is printed on quality paper contains post-consumer material. Under normal usage, the paper in this planner resists ink bleed with common writing instruments such as pencils, ballpoint pens, gel pens, felt tip pens and highlighters. Color your planner! 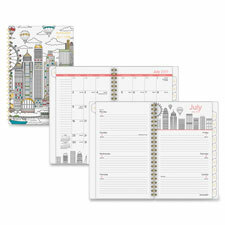 Cityscape designs decorate the pages of this professional monthly planner for coloring and doodling while making your schedule. Dated planning pages range 12 months from July to June and feature monthly tabs for easy reference. The two-page-per-month spreads offer unruled daily blocks, Sunday-through-Saturday scheduling, moon phases, ruled notes section, count of days/days remaining, holidays and one past and future months reference. Special pages include holiday listing, three-year (past, current, and future) reference calendars, event calendar, contacts and notes pages. It is printed on quality paper contains post-consumer material. Under normal usage, the paper in this planner resists ink bleed with common writing instruments such as pencils, ballpoint pens, gel pens, felt tip pens and highlighters. Weekly/monthly calendar features a classic medallion design that is given a twist when paired with vibrant colors. Dated planning pages range 12 months from January to December. Wirebound planner is tabbed for quick reference and navigation and provides equal space for weekdays and weekends. Two-page-per-week spreads offer ruled daily entries, Monday-through-Sunday scheduling and count of days/days remaining. Two-page-per-month spreads include unruled daily blocks, Sunday-through-Saturday scheduling, ruled notes column, count of days/days remaining, holidays, and past and future months reference. Special sections include holiday listing, three-year overview calendars, event calendar, contacts and notes. Plan out each week and month in style with this Monique planner. Wirebound striped cover features a pretty front with flowers in the top left and bottom right corners. Dated planning pages range 12 months from January to December and include count of days/days remaining. Monique design with flowers is prominently featured on the right hand page of the weekly spreads. Two-page-per-week spreads also include numbered weeks and equal-size planning spaces for each day of the week from Monday to Sunday to promote time management. For big-picture planning, the two-page-per-month spreads have the Monique design running across the top, unruled daily blocks to freely write in reminders on key dates, a notes column, moon phases, holidays and past and future months reference. Monthly tabs make it easy to open the planner to any date. 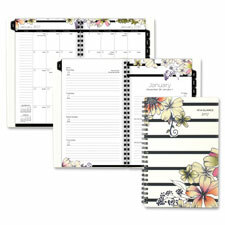 Special pages include a holiday list, three-year calendar reference, event planner, future planning, notes and contacts. Quality, recycled paper resists ink bleed.